A bold New York Times article today, "Secret 'Kill List' Proves a Test of Obama's Principles and Will," deals with the President's gradually emerging role as a one-man kill machine. It was said earlier in Obama's presidency that he was responsible for a lot of deaths, of Americans as well as others. By October 2011 his three years of policies were responsible for more US troop deaths in Afghanistan than occurred under Bush in the pervious decade But he has taken on a further function usually reserved for military dictators: ordering up a long list of specific assassinations. It goes without saying that, "precision," "highly safe" or whatever, the drone attacks normally kill a few extra "civilians." But now this is an elaborate game of picking names and faces from charts that look, the Times article says, "like a high school yearbook." And this is a game in which the President gets to make all the final moves. He likes to earmark each targeted assassination personally. "Mr. Obama has placed himself at the helm of a top secret 'nominations' process to designate terrorists for kill or capture, of which the capture part has become largely theoretical," the Times says in the opening section of this lengthy article. Despite his early promises to do so, Obama could not close Guantanamo. Or under pressure decided he didn't want to. And one of his main ways of avoiding the opprobrium of sending more prisoners there, is simply to kill people. Why are civil liberties organizations so upset with Obama? The treatment of suspected "terrorists" is one cluster of reasons. But there are others. In another arena, we have the Administration's unusually brutal crackdowns on whistleblowers -- much more so than under the previous administration -- highlighted by the long holding of Pvt. Bradley Manning in solitary confinement without charges or trial. That is a new wrinkle. But the old Bush policies too turn out to have also survived. As the Times "Kill List" piece points on, Obama's "pragmatism over ideology" rule led to some jaw-dropping corner-cutting on morality that links him with the neo-cons of the previous administration, while providing a soothing "soft" image suitable to his "minority" status and "liberal" campaign for President that led to such an outpouring of gratitude among progressives and minorities when he was first elected. "A few sharp-eyed observers inside and outside the government understood what the public did not," the Times story says. "Without showing his hand, Mr. Obama had preserved three major policies — rendition, military commissions and indefinite detention — that have been targets of human rights groups since the 2001 terrorist attacks." To these three extra-legal, war-justified actions was added the avoidance of visible prisoners: just kill them. Another observation in the Times is that Obama has found ways to dodge legal and moral obligations. He has invoked a case, New York vs. Quarles, where the Supreme Court ruled that in cases involving "urgent public safety" a suspect could be questioned without advising him of his Miranda rights. The President wanted to see how far Quarles could be pushed. "Maintain my options," the article says is Obama's rule. He is also maintaining his direct connections along the line with the previous administration, while maintaining the appearance of a different outward style. Obama has also encouraged a reinterpretation of data so the numbers of "civilians" involved can be reduced in deaths as a result of targeted killings, to make government d assassinations look cleaner and neater. "Mr. Obama embraced a disputed method for counting civilian casualties that did little to box him in," the Times article says. "It in effect counts all military-age males in a strike zone as combatants, according to several administration officials, unless there is explicit intelligence posthumously proving them innocent." The President was concerned about the killing of the innocent. His solution was to make sure everyone in a kill zone is by definition guilty. Innocent people don't hitchhike rides on a truck driven by members of Al-Qaida -- do they? 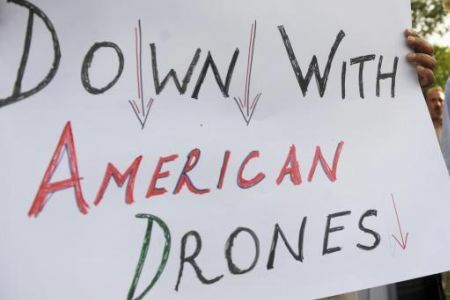 Opposition to the Brave New World of remote drone killings is growing. Partly these are the actions of a man who needed to prove he was not soft, but who wasn't willing or able to spar and make deals with the legislative branch as, most notably, Lyndon Johnson did. This is why he couldn't close Guantanamo. There was strong opposition, but Obama wasn't willing to combat it. "It was not only Mr. Obama’s distaste for legislative backslapping and arm-twisting, but also part of a deeper pattern, said an administration official who has watched him closely: "The president seemed" (an official said) " to have 'a sense that if he sketches a vision, it will happen — without his really having thought through the mechanism by which it will happen.'" And so where it was necessary to fight opposition to closing Guantanamo, Obama just let it go. This weakness fits in logically with drones and targeted killings -- actions Obama can carry out unilaterally, bypassing the need to twist arms in Congress. The Times article's bombshell image is of how the kills are worked out. "It is the strangest of bureaucratic rituals: Every week or so, more than 100 members of the government’s sprawling national security apparatus gather, by secure video teleconference, to pore over terrorist suspects’ biographies and recommend to the president who should be the next to die." This is a "secret nominations process" -- not so secret after this article -- conducted by "a grim debating society that vets the PowerPoint slides bearing the names, aliases and life stories" of potential "terrorist" (mostly Al Qaida) victims. Then the list goes to Obama and Brennan. Obama insists on signing off on every one personally -- deaths in Yemen, Somalia, and Pakistan. Do Americans know we are at war in these three countries, unilaterally? All this is emblematic of a gradual development begun in earlier administrations and continued under Obama: an increased granting of powers to the President beyond what the Constitution or practice previously allowed. And yet under Obama this excess of strength is combined with an excess of weakness -- because the combination of the current dysfunctionality of Congress and the President's inexperience and unwillingness to make deals, mean the executive has less direct influence over the legislative branch than it has had in other administrations. There are those of us who did not rejoice at the targeted assassination of Osama bin Laden -- though at least he was likely guilty of crimes, indeed most heinous ones. In the day-to-day or week-to-week "high school yearbook" killings constantly earmarked by the president, with their covered-up "collateral damage," there is even less to rejoice at. 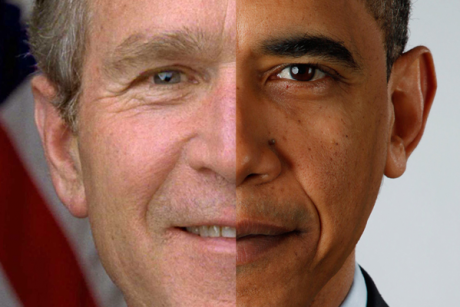 But while that Osama bin Laden exploit, not just signed off on but closely followed, of course, by Obama, might have originally seemed a bold and unusual exploit on the President's part, it now emerges as his quintessential style -- quite different from George W.Bush's, while still continuing post-9/11 policies. 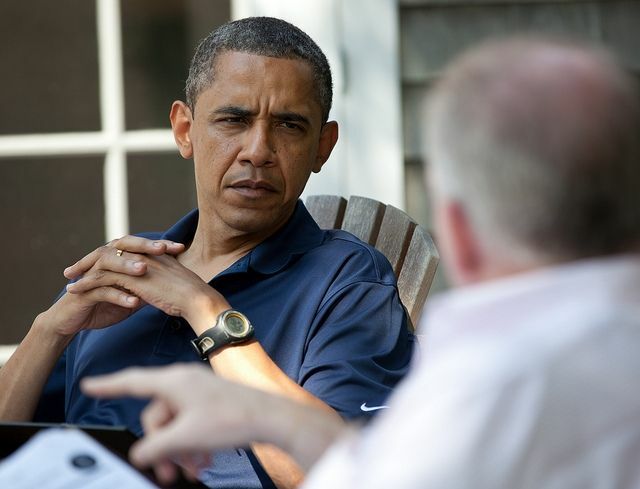 Photo from a Salon article by David Bronwych, "Inside the Bush-Obama administration," August 18, 2011.